A short-term behavior modification plan can break through a cycle of bad behavior in your Aspergers (AS) or High-Functioning Autistic (HFA) youngster. Think of it as a learning tool to help him move forward to a new level of social development. Four to six weeks on the plan is usually enough to change one or two specific behavior problems. At the very least, your youngster will have a clear understanding of your expectations for his behavior, even if he is not yet able to consistently maintain the desirable behavior. A chart system is useful when chores or homework are the issues. Use daily stars or stickers for completed tasks with weekly rewards for good performance. Weekend privileges or rewards are clearly dependent on consistently responsible behavior through the week. Charts make sense to AS and HFA children since they are so visually-oriented, and they take pride in a full page of stickers showing their good behavior. Use your word processing software to make a chart, or find some on the Internet (just do a Google search for “behavior charts”). A poker chip system is easy and inexpensive. All you need is a box of poker chips and a package of the new disposable food containers. Introduce the plan in a positive way when you show your youngster the chips and let him personalize his box with markers and stickers. The poker chip system is effective because it encourages immediate rewards for positive behavior. Talk with your child to see what system (chips or charts) would have the most meaning to him and have him help you come up with a list of meaningful rewards to choose from when he meets one of his behavioral-goals. 1. Be sure to recognize if the chosen reinforcement isn’t motivating enough and modify it. Children will lose interest if they don’t see or feel the rewards of their good behavior. Be flexible with the rewards. 2. Break the day into manageable increments of time. For some kids, it may reasonable to expect them to avoid the target behavior for an entire morning, but for others you may need to start with blocks of time as small as 15 minutes long. Remember, you are trying to help your youngster be successful in his efforts. 3. Identify both the behavior you are trying to modify and the behavior with which your youngster needs to replace it. List these behaviors in simple-to-understand, plain language either on the bottom of the chart or on a piece of paper nearby. Try color-coding the undesirable and desirable behaviors and placing them directly across from each other so your youngster can easily see which behavior is inappropriate and what the alternatives are. 4. Identify the areas where the child has strengths. For example, your child may have no problem going to bed on time. Praise the child for this behavior and encourage her/him to keep it up. 5. If focusing on a long term goal is unmanageable, a more immediate reinforcement is needed. You can work for a simpler reward, like a preferred activity such as an extra story at bedtime, a favorite bath toy or a special game. 6. It may be that your youngster has several behaviors that you would like to extinguish or many chores he doesn't complete to your satisfaction, but in order to be successful, you need to choose one or two major issues to tackle first. Behavior charts are only successful if a youngster is given the opportunity to succeed. Choosing too many target behaviors can set him up to fail. 7. Promote success at the beginning and work your way up to higher compliance requirements. 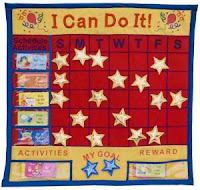 In order to get your youngster on board and feeling good about using behavior charts at home, you'll need to set your success goals low (perhaps at 30 to 40 % compliance rate). As he shows some consistent success in meeting his goals, you can slowly increase the expectation of what constitutes success. 8. 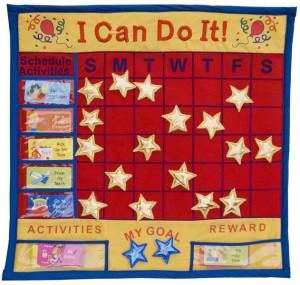 Set up a chart large enough so that your child can see the clear picture of how he is progressing. Let your child help with the designing of the chart; make him feel excited about the program. This lets him understand he is in charge of the results of the program. This is the how your child will start understanding and learning consequences. 9. Update the chart immediately after the desired behavior for a younger child. Update the chart daily for your older child. Do so in the presence of your child reiterating the goals of the program. 10. You can assign levels for different privileges. Earning all stickers every day for a week deserves a big reward. You keep the chart system motivating when you reward smaller privileges based on the number of stickers earned. 1. Be sure to recognize if the chosen reinforcement isn’t motivating enough and modify it. Children will lose interest if they don’t see or feel the rewards of their good behavior. Be flexible with the rewards – and on the first day, give chips out like crazy just so he gets the idea of how to earn them. 3. Carry the chips with you in your pocket, and when you catch your youngster doing the right thing, hand him a chip or coin and have him put it in his box. Make a big deal every time you give him a chip, so he fees proud. Remember never to take chips away – this is a reward system – not a punishment system. 4. Chips can be used to do special activities. You can set up an activities chart with your youngster of different preferred activities (e.g., computer time, watching a movie, jumping on the trampoline, a bike ride with dad, a walk with mom, etc.). Have your youngster help you decide how many chips he needs to earn to pay for that special activity. Throughout the day, give your youngster chips when you catch him doing the right thing. 5. Chips work visually and tactilely as a delayed or immediate reward system. You can purchase poker chips or even use coins. Have your youngster decorate a box or a jar that he can place in an easy to access area, to collect chips throughout the day for good behavior. Tell him he will be earning chips for good behaviors and list those good behaviors with him (e.g., cleaning up toys, eating healthy meals, good sharing, good talking, listening when parents are talking, nice touching, etc.). 6. Focus on one or two specific goals for intensive behavior change. Or, make a list of generally desirable behaviors, such as cooperation, honesty, kindness, and responsibility. Then, you decide when to reward the youngster with a chip when he exhibits these qualities. 7. For the system to work effectively, the rules for behavior and rewards should be presented so that everyone clearly understands the plan. Small rewards, such as an hour of choosing his favorite TV programs, will usually cost one or two chips. The price is higher for larger rewards, such as dinner out with the family at the youngster's favorite restaurant. 8. Identify the areas where the child has strengths. For example, your child may have no problem going to bed on time. Praise the child for this behavior and encourage her/him to keep it up. 9. If focusing on a long term goal is unmanageable, a more immediate reinforcement is needed. You can work for a simpler reward, like a preferred activity such as an extra story at bedtime, a favorite bath toy or a special game. 10. If your youngster changes some behaviors immediately, continue to positively reinforce him for those behaviors, while adding one or two more challenges to his list of rewarded behaviors. After a few weeks on the chip system, take a break and observe your youngster's progress. You can start back when you recognize a problem. Most AS and HFA children enjoy a behavioral system because it helps them know what is expected of them in a structured, but fun way. Explain that you want them to learn good behavior and habits, and this is a way to do it. Begin immediately, and reward chips and stickers generously. If your behaviors and privileges are not lining up fairly, or your youngster begins to manipulate the system, change it at the end of the week. Reward systems are to be used in any situation you may need (e.g., getting dressed, keeping your hands to yourself, not making noises, good sharing, not yelling, etc.). If you find that these systems are a positive influence on your child, share the information with his teachers or anyone else that will be interacting with him. Positive reinforcement will be so much easier than any form of punishment. Reward systems are a great way to stay proactive. A behavior modification program not only offers negative reinforcement to undesirable behaviors, but also rewards positive behavior. Have fun with the program. Negative behavior that isn’t a part of the behavior modification program still needs to be addressed. Use more conventional deterrents like time-outs and groundings. Remember to be consistent and follow through with the program. For teens, you will want to use the suggestions here: http://www.myoutofcontrolteen.com/DefiantAspergersTeen (you may have to cut and paste the URL into your browser). Aspergers last week. I found your blog and you have no idea how much it has helped me understand things better. We will be starting the chip system with him today. Thank you for such a common sense approach. Thank you so much for this post. It has shown me a way that i can see will be very effective with my son. Being only diagnosed a few days ago, but knowing the issue for a while, behaviour has been a huge problem and i can see the light will show very soon in our right now dark tunnel. I am hoping that someone can help me with some ideas for my son who was recently diagnosed with Aspergers. We seem to be having trouble with him being able to focus and keep his hands to himself while he is at football practice. We have recently started a behavior modification chart for him yesterday. It appeared that the chart worked somewhat, but I am wondering if there is any advice from others that have gone through a similar situation. I am think of writing up a social story for him, but have never done that before. Any suggestions or tips would be greatly accepted. Thank you in advance for your help.